Parlez-vous français? At Catholic University, students of all levels of proficiency are invited to engage in the study of French language, literature, and culture. Whether you are new to French or have some experience, majoring in French Studies will give you the opportunity to explore exciting new cultural and intellectual horizons. In your major classes, you will become proficient in the French language while receiving a thorough introduction to French history and literature. A core of liberal arts courses complements your major, allowing you to make interdisciplinary connections in theology, philosophy, art, and literature. As a French Studies major, you are encouraged to spend a semester studying abroad in France, where you will enhance your studies with firsthand experience of French language and culture. Your time abroad will give you a deep understanding of another culture, which will provide you with a competitive edge in your career search after graduation. Foreign language study allows us to connect with others across cultures. 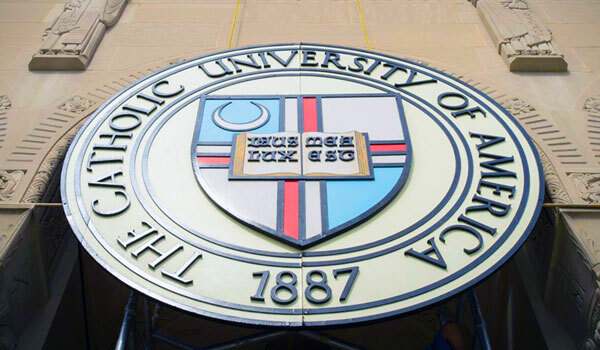 In your first year at The Catholic University of America, you will take classes in philosophy, theology, and English as part of a small learning community of about 18 students. Within this community, you will begin to think about what it means to be human, forming the basis of how you approach different cultures. Catholic University's location in Washington, D.C. will offer you ample opportunity to participate in the rich culture of our nation's capital. For example, you may choose to pursue an internship at an organization like the French Embassy or the European Union, where you will gain firsthand experience in international affairs. The French Studies faculty forms a dynamic community of professors who will enrich your study of both French and the liberal arts. With a small number of French majors, you will form close relationships with your fellow students and will help each other as you master the language. The global citizen is a competitive applicant in any number of professional fields. As a French Studies major at The Catholic University of America, you will explore French language, literature, and culture in the broader context of a first-class liberal arts education. You will develop sharp critical thinking and writing skills, which will put you at a significant advantage in careers that require communication, organization, and leadership, such as careers in foreign service or international business. Students interested in teaching are encouraged to explore the interdisciplinary B.A. in French and Secondary Education.